The 31st July 2017 marks the 100th anniversary of the first day of the Battle of Passchendaele. Also known as the Third Battle of Ypres, this battle became infamous for the 60,083 British deaths and the torrential rain which lead to a quagmire of mud. These stunning poppy pins have been designed to pay tribute to each one of the fallen British soldiers from the Battle of Passchendaele. 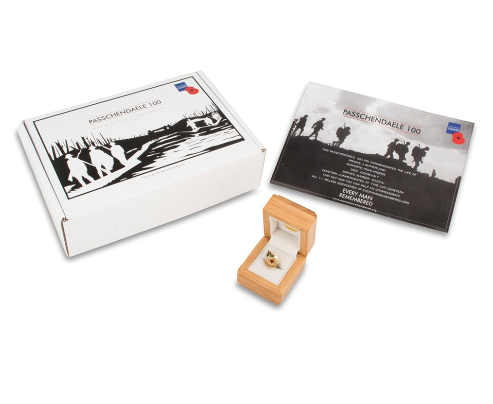 Every pin comes in a lacquered wooden presentation box with a Certificate of Authenticity and a Commemorative Certificate detailing a British soldier whose life was lost 100 years ago during the 103 day of the Battle of Passchendaele . Each pin is engraved with ‘YPRES 1917’ on the reverse.